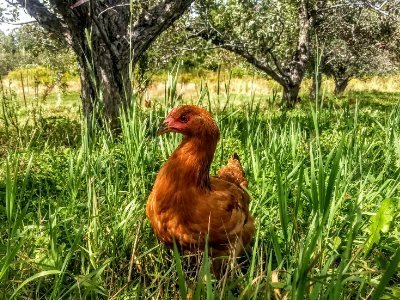 The chickens at Grandview enjoy a true free-range life under the apple trees! Grandview sprays absolutely no harmful chemicals which is the only reason we are able to utilize chickens. They are strategically managed in the orchard in the spring during times when apple pests are emerging from the soil. They are useful for scratching up any undecomposed leaves under the trees which is where a lot of disease inoculum hides for the winter. 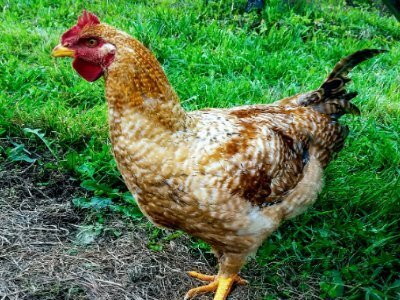 Chickens also provide excellent fertility complete with micronutrients such as manganese which is absolutely critical for optimal photosynthesis, but often either deficient or unavailable in the soil. In turn, the trees provide shelter from flying predators such as hawks and owls. Our chickens return to their enclosed mobile coops for the night. We recognize that any ecosystem is made up of a very diverse group of plants and animals. In an orchard setting, we are able to produce high quality pastured meats without taking land out of fruit production. It is a unique opportunity and although there is still much more to learn and figure out, we are happy to see more farmers and orchardists recognizing the benefits of incorporating these regenerative practices. Onward! Our chicken can be purchased either by reserving ahead of time, at the Antigo Farmer’s Market or sometimes in the orchard store during our seasonal hours. If you’d like to learn more about our practices, we encourage you to attend the Sustainable Farm Tour, attend one of our orchard events, or inquire about a tour for either a group or an individual. Tours can be geared towards your interests whether it’s casual curiosity or you’re looking for more technical information. We are very interested in teaching, sharing information and talking with others who have similar interests or goals. Of course, our work and commitments need to come first and we do need to charge a minimal fee for tours, but we will do our best to accommodate! View some of our other delicious, natural products. We have apple cider in half and full gallon barrels, pies made from our apples along with locally made: honey, maple syrup, jams, wild rice blends and salsa. A little of something for everyone!